'What are you doing to my wine?" That's what Karissa Kruse, president of the Sonoma County Winegrowers, heard from more than a few consumers in response to the organization's ambitious sustainability initiative. The voluntary program is aiming to make Sonoma County the nation's first 100 percent sustainable wine region by the year 2019. The organization says it's taking on the project to ensure the long-term viability of grape growing and agriculture in Sonoma County, but also to help move the region a peg up in the global marketplace. Consumers do not reward organic labeling the same way they do when shopping for food and other products, and, apparently, some people confuse "sustainable" and organic wine, which was just too darn crunchy for them. "Historically, we've seen that more around biodynamics and organics," Kruse says. "There's been some consumer confusion—that the practices that go into it impact the taste of the wine." In other words, people were making the age-old association of dirt with "dirty." But increasingly, consumers are getting a new message: sustainability is green, and "clean." The feedback they're getting to questions like, "Why would you buy sustainable wine?" is the opposite, Kruse says. "It's because they think the quality is better." The five-year sustainability plan was launched in 2014. As 2019 approaches, Sonoma County winery and vineyard operators have implemented progressive environmental and personnel development projects too numerous to list here. 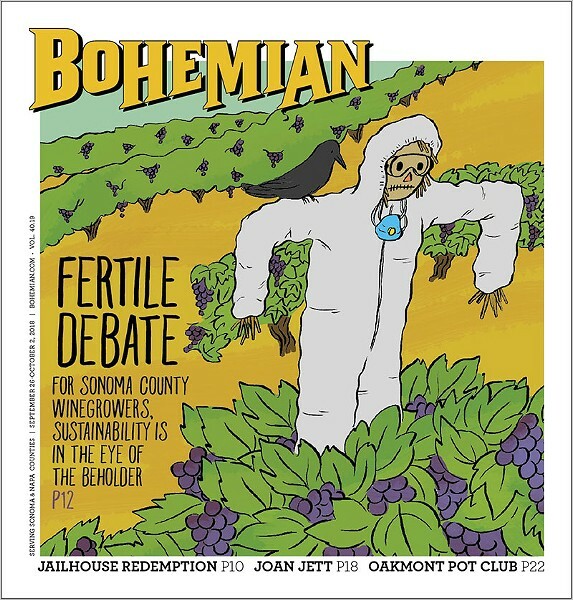 But as the Sonoma Sustainable label rolls out to consumers, are wineries aiming to have their Chardonnay and drink it, too—passively benefiting from the positive messaging of organic farming practices while evading inconvenient prohibitions on fertilizers and pesticides? In recent years, I've noted a war of words in discussions about organic and sustainable certifications that does not seem necessary. It's not enough to tout the benefits of one; the other must also be put down. Sometimes, those who favor organics complain that when a winery says it's sustainable, it doesn't mean anything. More often, winery representatives tell me that sustainability "goes beyond organics." I was once told, in all earnestness, that sustainable farming only selectively targets pests, like a smart bomb, while, "in organics, they kill everything!" It isn't the Sonoma County Winegrowers pushing this view. "We have growers that are organic and biodynamic and sustainable," Kruse says. "And they're all good. Any time farmers are focused on what they're doing is good. I think people try to pit the programs against each other, and I don't think that's fair to the farmers who are trying real hard to do the right thing." The Winegrowers' reports on the initiative's progress published since 2015 do a great job of explaining their goals, and include many profiles of local growers and ag leaders who have found cost savings or other benefits by implementing best practices in energy use, habitat and human resources. It's worth noting that the reports make minimal mention of organic or biodynamic certified vineyards. For example, one report discusses how Ridge Vineyards uses cover crops, but doesn't say the vineyards are certified organic. What does it mean to be sustainable for the Winegrowers? Is it more than just marketing? To get a better idea of the nuts and bolts of the program, I sat down with former Winegrowers sustainability manager Emily Farrant last year to discuss the grape growers' self-assessment, the first step of the certification process. She's now an independent auditor of the program. To become Sonoma Sustainable, there are four ways to go. The California Sustainable Winegrowing Alliance certification program is the main standard the Winegrowers use. Three other programs with their own rules are also accepted: Fish Friendly Farming, Lodi Rules and Sustainability in Practice. Organic certification will not get you a Sonoma Sustainable seal of approval. Here's how it works: the workbook has 16 chapters, each dealing with an aspect of vineyard management, human resources, winemaking practices and other topics. Each section contains a series of statements in four categories, and respondents are asked to choose which category best describes their operation. For example, in section 7-5 on wine quality, answering "Knowledge of wine quality consisted of only tasting local wines or none at all," will get you category 1. The better answer is, "Wine regions elsewhere in the state and internationally had been visited and toured," one of three prerequisites for best-practices category 4. In section 3-3, on leaf removal, category 2 states, "Leaf removal was sometimes done, or very lightly done, to minimize costs." Most of the best-practices answers here have been taught for decades as simply good, modern farming. Doing just a little better than showing up will earn a category 2. But growers cannot hang out in category 2 forever and be re-certified, Kruse says. "Every year, you're having to do something, whether lowering water use or doing something for employees. You have to do something that shows you're moving the needle in one of the assessments." Continual improvement is the mantra of the program.